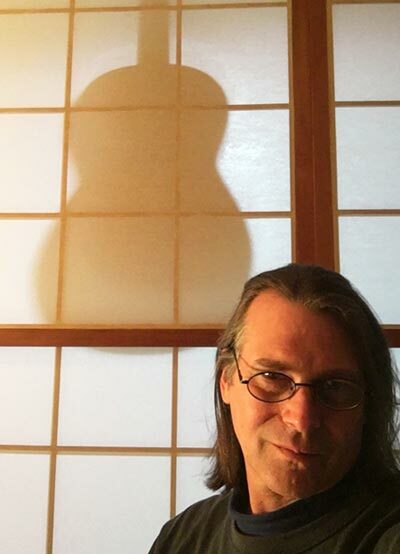 I’m an American guitar maker living in Akune Japan on the West Coast of Kyushu. I make fine quality flamenco, classical and specialty guitars on commission for Japanese and international customers. My story begins in high school, I played the cello and guitar. I had already developed an interest in making in guitars and through high school band teacher I was connected to Burdell Tenney who was a violin bow maker in Southern California where I grew up. Mr. Tenney was my first instrument making teacher, coaching me at my first efforts to make musical instruments. He was also a 1930’s WPA artist and an architect by trade. He imparted to me a lifelong passion for string instruments, art and making things by hand. I studied anthropology, art history and studio art in Jr. College and transferred the San Francisco Art Institute in 1991. After graduation in 1993, I was accepted to Mills College in Oakland and finished the Masters of Fine Arts course in 3D Concepts in 1996. After these formal studies I contacted Eugene Clark, a noted American guitar maker who lived in Berkeley CA. I asked him if I could visit his work shop, he asked why. I said, “I want to build guitars.” Gene said “Lots of folks want to build guitars.” His tone was skeptical. I asked if I could only come look at his work bench and his tools. He was amused. “Why just the tools and the bench?” I replied “By seeing your tools, your bench and your setup, I can learn a lot about guitar making without asking a lot of questions.” He liked my answer and said please come visit, I will teach you because you’ll ask good questions. Working with Eugene Clark was important, he taught me to understand what the great Spanish guitar makers did and how to use that knowledge in my own guitars. I brought my completed guitars to his workshop he would grade them and advise me on subtle points of Spanish style construction and sound. He gave me difficult critiques and I would take the information back to my workshop and do the work again if it wasn’t good enough. After two years of his guidance I worked on my own. I have always loved making things by hand, especially guitars. If you choose me to make a guitar for you I’ll bring all my experience and hard work into the process.